Catherine Burton (known as Kitty) was born on 1st August 1905, the 9th child in a family of eleven children born to parents Henry James and Sarah Jane Burton of Adelaide South Australia. Mr Henry Burton was head warden at the Adelaide jail and although his wages were low he was determined that all the children would receive a good education. Tragedy struck the family during WWI when the older son Lieutenant Harry James Burton was killed in action at the landing of Gallipoli on April 25th 1915 at only 19 years of age. Catherine's early schooling began in 1911 at the Currie Street Observation School in Adelaide followed by five years at Adelaide Girls High School which she completed in 1922. Two of her older sisters were already in the teaching profession and this was also the career chosen by Catherine. She spent two years at Teachers Training School and Adelaide University and graduated with her Teacher's Certificate in December 1924 at the age of 19 years. Catherine was already familiar with the Mallala district as she was a school friend of Alice Nairn of Grace PLains (who was the teacher at Stony Point School) When a teaching vacancy became available at the Mallala School she applied for it and was awarded the position. In January 1925 she started teaching a group of 60 children comprising Grades One, Two and Three. 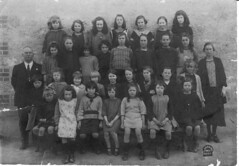 1928 - Instrumental in starting the Mallala School Welfare Club. 1928 - Formed the Mallala Girl Guides and Brownie Company. Pianist and teacher in the Mallala Methodist Sunday School. Organist in the Mallala Methodist Church and secretary of many church groups. 1931 - Engaged to be married to Oliver Leigh East of Mallala. 1931 - Taught at Flinders Street Demonstration School for two years until she resigned from the Education Department to be married. 1933 - Married Mr O. L. East (known as Buller East) who was secretary of East Bros Pty Ltd. Two children were born: James Burton East in 1934 and David Leigh East in 1936. World War Two: The RAAF No 6 Service Flying Training School was built at Mallala in 1941. Mr and Mrs East were among many local families who opened their home to accommodate an airforce family. Flying Officer S.R. McCracken and Mrs McCracken lived with the East family for two and a half years. Mrs Catherine East returned to her teaching career during WW2 at the request of the Education Department due to the shortage of teachers. During the war years there was no organized sport for the children and Mrs East encouraged the girls to play basketball at school and the boys football even umpiring both the sports herself. She ceased teaching in 1947. In 1950 she was once again recalled to service during that year as a relieving teacher at the Migrant centre established to utilize part of the Mallala Aerodrome. She was then employed back at the Mallala School to fill a shortage of teachers. Families of RAAF personel had moved into accommodation at the Mallala RAAF Base and the children came by tender into Mallala for schooling. She concluded her teaching career in 1955. What a great achievment. 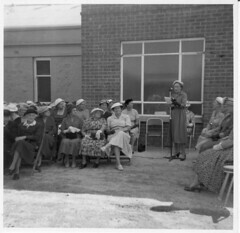 Mrs East always retained her interest in the education of the local children and in the Mallala Primary School and for many years was invited back to the school for special events. In 1967 Mr O.l. East died following many years of poor health. 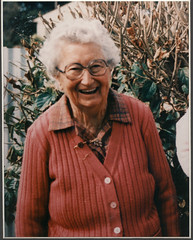 Mrs East was a foundation member of the Mallala branch of the Country Womens Associaion and assistant secretary for many years as well as branch historian. During different periods of her life she was involved in various town, church and sporting organizations usually taking on a volunteer leadership role. Mrs Catherine East was an instigator in the formation of the Mallala and District Historical Society in 1968 and had been quietly working to achieve this aim for some time. On the closure of East Bros Ltd manufacturing business in 1970, the District Council of Mallala purchased the old two storied Flour Mill which had been used by East Bros Ltd. for storage and for a Paint Shop in which to paint their implements. The generous gesture by the D.C. of Mallala enable the Mallala Museum to take over these premises. Mrs East loved collecting the history of the district and with the assistance of the foundation members was able to set the Mallala Museum on a course to being the prestegious museum it is now in the year 2012. Mrs East had a love of history and was asked by various organizations to research and print the history of the following Mallala organizations. Centenary of the Mallala Methodist Church 1974. Centenary of the District Council of Mallala 1974. Centenary of the Mallala Primary School 1977. Centenary of the Mallala Mill building (by then Mallala Museum) 1978. Story of East Bros at Mallala. Centenary of St Malachy's Catholic Church Mallala 1982. Centenary of St Peters Anglican Church Mallala 1984. Centenary of Mallala Institute 1985. Mrs Catherine East died on 17th February 1990 and is interred in the Feltwell Cemetery at Mallala. Do you remember Catherine East (nee Burton) ? Then Join up and add your memory here.